Cap: 25-75 mm in diameter, convex to broadly convex to plane at maturity. Reddish cinnamon brown maturing to golden brown to light yellow. Surface dry with often-persistent remnants of universal veil on cap (spots). Flesh white soon bruising bluish green. Stem: 125-175 mm in length, yellowish. Flesh bruising bluish green where injured. Persistent membranous annulus (ring) from partial veil that becomes dusted with purple brown spores at maturity. * Spores intended for microscopy and taxonomy purposes only. Images provided for informational and educational reference only and originate from cultivators and labs outside the US. Cultivation of this species is illegal in many countries including the United States. Please check your local regulations. Combo Savings! Purchase this sample along with your choice of other available Ps. 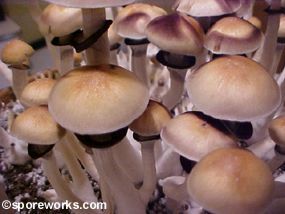 cubensis strains in our Psilocybe cubensis : 4 Pack Your Choice Grab Bag Special and save 25%! 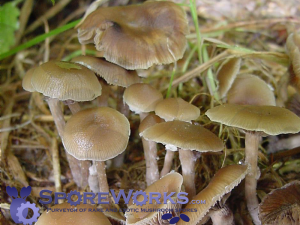 California, Idaho, and Georgia residents: Orders requesting Psilocybe Genera Spores shipped to California, Idaho, and Georgia will be refused, voided, or refunded. 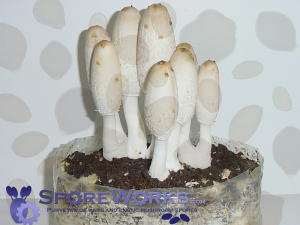 Possession of these mushroom spores may be illegal in CA, ID, and GA without the proper permissions.